Taking public transportation is definitely not a fun activity that anyone looks forward to, regardless of how good it may be for the environment. But what if something could make you eagerly anticipate your morning and afternoon commutes? 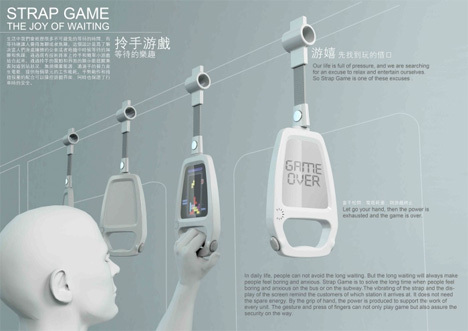 The Game Strap is a concept from designer Jian Qian that would turn the safety straps in public transportation into fun video games that would relieve the tension so many of us feel on the bus or train. As an added bonus, it might even encourage young people to give up their seats to less able-bodied commuters. The straps would hang from the ceiling and be powered by the motion of the vehicle and the pulling of the user’s hand. 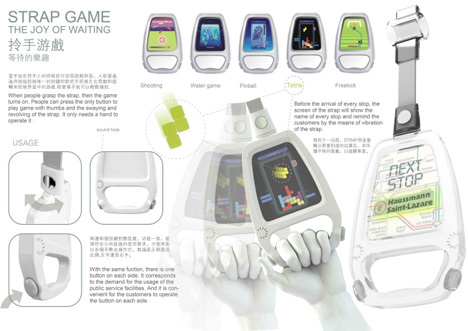 Games like Tetris or shooting games which require minimal movement and can be operated with a single directional pad would ideally be installed. A system of vibrations and flashing messages would let passengers know what stop is next so that no one gets so involved in playing that they miss their corner. And of course, the straps can still be used as simple security straps for commuters who would rather not add some play to their day. See more in Mass Transit or under Transportation. December, 2011.